I first became interested in Lil' Jamz headphones by Monster Cable because I was having trouble finding a set that had ear buds that would fit my 6yr old son. 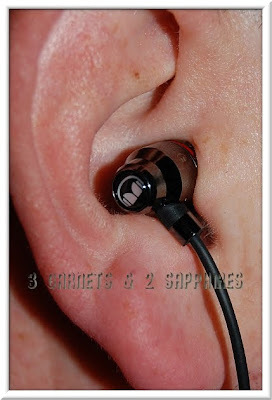 These in-ear headphones come with four additional ear tips of various sizes. It turned out that even the smallest size did not fit inside my son's ear canal. I cannot tell you how thrilled my husband was to learn that these top of the line headphones would be all his. 1) The accessories that come with these headphones are very well thought out. The box can be used for storage and has a magnetic closure. There is also a protective pouch that offers another way to store these headphones for travel or when you are on the go. 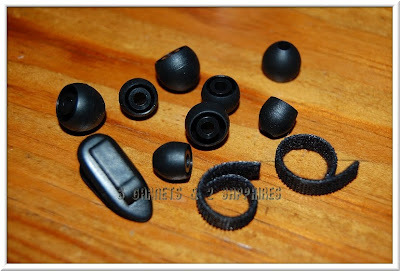 2) As previously mentioned, these headphones come with an assortment of various size ear tips. There is also a clip to keep the wire against your body and small Velcro strips to manage your wires as you see fit. 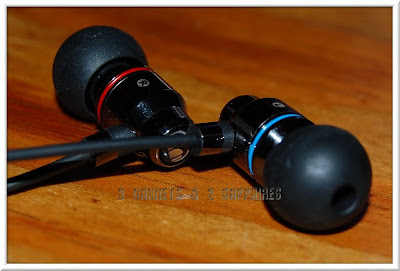 3) The earpieces are marked right and left, but they are also conveniently color-coded with a red and a blue stripe. 4) The construction of these headphones live up to the Monster Cable reputation of using the best materials. Most metal parts are made of chrome-plated machine steel. 5) In addition to having 24K gold contacts inside, the jack also has a gold-plated tip, which is best for conductivity. 6) The sound quality produced by these headphones exceeded our expectations. They offer crisp sound at any volume. There was no distortion at high volumes. 7) While testing these headphones out with acoustic guitar music, my husband could hear the guitar pick hit the strings at the beginning and end of each stroke. That is how crystal clear the sound quality is. 8) There was one thing that kept these headphones from being perfect for us. The jack had a contact issue, in which it had to be twisted exactly to the right position in order for the headphones to work. When not twisted to the right position, no sound came through the right ear and what sound came through the left ear sounded hollow. We had this issue when using these headphones with both an iPod and a notebook computer. I cannot help but think that this may be an issue with our particular set of headphones because I just can't see Monster Cable putting out headphones for $89.95 that had this problem. Most users will be moving around with their MP3 players, so this problem would not have gone unnoticed. Just to be cautious, I would keep your receipt if you decided to purchase. UPDATE: After reading about the connectivity problem we were having with our set of headphones, Monster Cable was nice enough to send us a set of replacement Lil Jamz. This new set works perfectly, proving that the original set had a manufacturer's defect. In an astonishing turn of events, these headphones have an even better sound quality than the first set, which we never thought would be possible. I would recommend these headphones for anyone who values the best sound quality. Since they do cost more than an everyday pair of headphones, I would only recommend them for someone who will treat them with care and who is unlikely to misplace them. You can purchase these headphones right on MonsterCable.com . Visit LilJamz.com for your chance to be featured on future Lil' Jamz headphones packaging by entering the Monster DJ Contest. Other prizes include over $600 in Monster DJ gear and more. Please see the website for official contest rules. 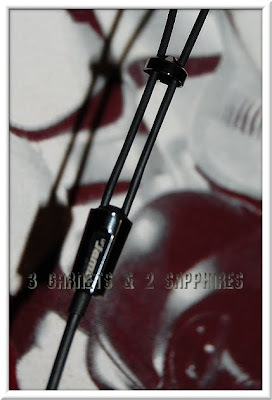 Thank you to Monster Cable for sending us a set of sample earphones free of charge along with product information and images to base this article upon and for providing another set of earphones to our contest winner. One lucky reader will receive one set of Monster Cable Lil' Jamz In-Ear Headphones (ARV $89). Take a minute to look over the list of Important Monster Performance and Safety Tips. Then leave a comment telling me something you learned from these tips. You MUST do this to be eligible to win this contest. 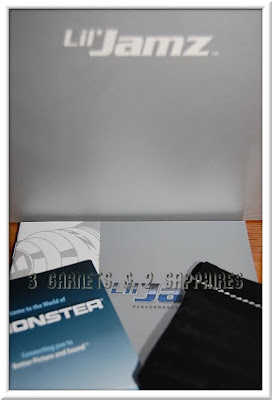 3) For 10 extra entries, blog about this contest linking back to this post AND Monster Lil' Jamz. Then come back here and leave TEN separate comments with the link to your blog post. 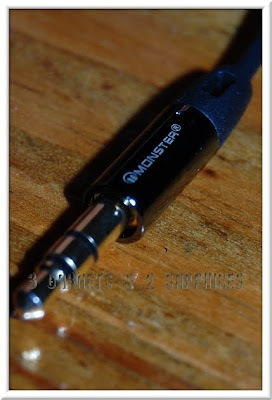 5) For 1 extra entry each, follow Monster Cable on Twitter and/or fan Monster Cable on Facebook. Then leave a separate comment to either your Twitter or Facebook profile for each entry completed for up to 2 extra entries. This contest ends on Monday, March 8th, 2010 at 11:59pm EST. A random number drawing will be held shortly after. The winner will be announced here and will be contact via email or through their blog. If the winner does not respond within 48 hours, a new number will be drawn.